Optimists. You know, those endlessly, unbearably sunny Pollyanna’s going through life in a perky mood. Optimism is much more than a reckless chirping through life. It can actually change your life… help you cope, and shift the way you think about setbacks and victories. It’s a psychological righting reflex. Every soul years to be free. You CAN retrain your brain to see life differently. This lift-your-spirits Keynote reminds us all to lift our life to its highest calling and living our lives fully from a sense of possibility and the expectation of positive results. Optimism is the high-voltage power tool in the life-skills toolbox that can help you get promoted, fight off the cold that’s been going around, and attract people to you. Pessimistic people are two to eight times more at risk of depression and are difficult to appreciate. Using humor, inspirational stories, and time-tested tips for dealing with life’s trials and tribulations. We are reminded that the right to choose our own path is a sacred privilege. 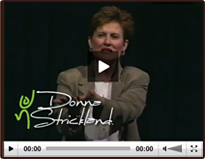 This entry was posted by Donna Strickland in Dynamic Keynotes, Free Resources. Bookmark the permalink. Follow comments with the RSS feed for this post. Post a comment or leave a trackback.